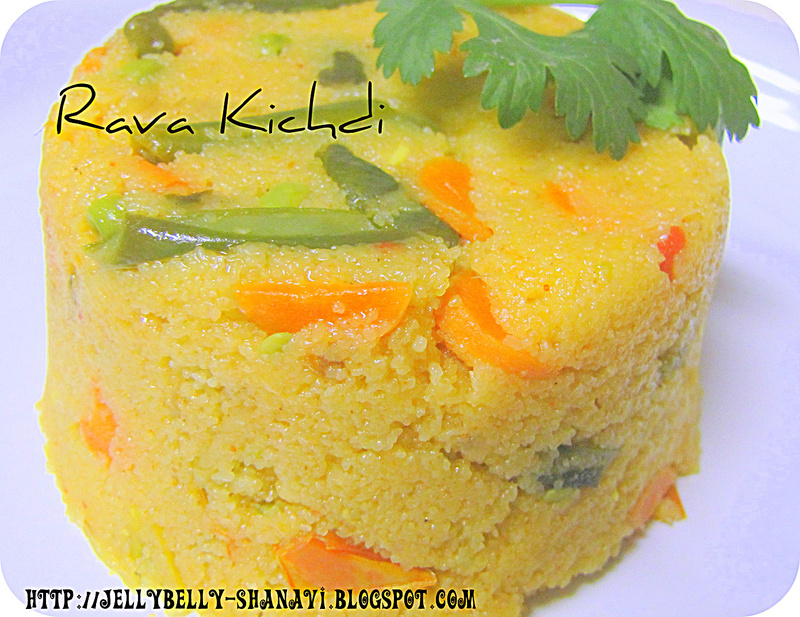 Rava kichdi is a healthy breakfast item and ofcourse a quicky one from the kitchen. Again i made this long back and it was there in my draft for quite a long time. It's such a comforting and a fulfilling dish to start ur day with loads of veggies.. Onions -- slivered -- 1/2 no. Tomato -- chopped --1 no. Dry roast the sooji /rava until it turns colour and u feel the aroma. Switch off and transfer to a plate and cool it. Heat a wide karahi and add the oil. Do the seasoning with mustard seeds and pop it. Then add the urad dal and the channa dal . Fry until it turns pale golden colour. Add the curry leaves also. Now add the onions and saute for a minute.Drop in the minced ginger or GG paste now and saute for a minute. Then add the tomatoes and cook until it's totally disintegrated. Throw in the green chillies and stir as well. Dump in the vegetables one by one and saute the veggie for 3 minutes in medium flame. Now the veggie's must be half cooked and so add the 3 cups of water and the salt. Mix well. Cover the karahi ,raise the flame to medium and let the mixture boils and the veggie's are cooked fully. This will take another 4 minutes. Later slowly add the roasted rava /sooji and keep on stirring well so that no lumps formed. Make sure u keep the flame in medium low and incorporate well. Ur kichdi will be ready in a minute.Finally add the coriander leaves and mix well. Switch off the flame and Njoy !!!! Truly inviting and delicious khichdi..Havent prepared since a long. oh!kichadi looks delicious n nice clour n grt click..
Khichdi looks so nicely made and soothing. Great recipe. Healthy and yummy breakfast,looks so perfect. wow this is very very healthy and colorful! very yummy too! wow, I have been craving these so much. Now, I will have to make them real soon. Beautiful and so tempting pics!